Crown Books for Young Readers, 9780553534740, 272pp. On the day the tsunami strikes, Kai loses nearly everyone and everything he cares about. But a trip to New York to meet kids whose lives were changed by 9/11 gives him new hope and the chance to look for his estranged American father. Visiting Ground Zero on its tenth anniversary, Kai learns that the only way to make something good come out of disaster is to return and rebuild. Fans of Jewell Parker Rhodes’s Ninth Ward and Karen Hesse’s Out of the Dust will embrace this moving story. An author’s note includes numerous sources detailing actual events portrayed in the story. Leza Lowitz’s writing has appeared in the New York Times, Huffington Post, Shambhala Sun, Asian Jewish Life, and Best Buddhist Writing of 2011. She has published over seventeen books, including the APALA Award–winning YA novel Jet Black and the Ninja Wind, which she co-wrote with her husband, the bestselling Yoga Poems: Lines to Unfold By, and her most recent Here Comes the Sun: A Journey to Adoption in 8 Chakras. Leza, an American, lives in Japan with her husband, Shogo Oketani. You can visit her online at lezalowitz.com. 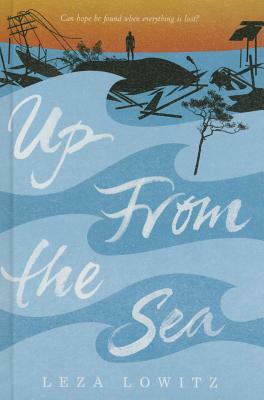 "A story of hope not only for those who lost everything to the tsunami but for the whole of suffering humanity, [Up from the Sea] is a work of great depth, the fruit of long research, and a masterpiece from a writer who feels the cry of humanity very deeply. [It] underscores powerful lessons on the primacy of community...Besides being highly entertaining and captivating, Lowitz’s writing is purpose-driven and offers wonderful lessons about recovery, hope, and perseverance."